Are You One of The Lucky Menopausal Women? Are you a lucky menopausal woman? Or just a lucky woman? How do you know? I feel lucky. Does that mean I don’t have bone crushing business issues? No. Does it mean I am thin and gorgeous and look twenty years younger than my age? No. Does it mean my friends and family are not riddled with some form of strife or another? No. Does it mean night sweats are a thing of the past? Hell No! Am I wealthy and planning on buying a caribbean retreat? No. So how am I lucky? I have a roof over my head and enough food to eat. I even enjoy my roof and most of my food (dieting puts a damper on the food at times). I have a husband who’s not perfect – but he’s a good guy and I enjoy being with him. I have three beautiful rescue bulldogs who love me very much. I have a Mom who loves and supports me and makes me laugh. I have a business that makes me proud – not rich, but proud! I have been fortunate enough to have my book published – It’s not setting sales records by a longshot, but at least it’s published! How much luckier can you get than that? At this stage of life, when so many of us are questioning the value of what we do have and in some cases contemplating scary changes – it is so critical to stop and think about why we’re lucky. Some seem to have so much – and some so little. Most of the people I know are facing major challenges of one form or another. I am facing major challenges – but that doesn’t mean I’m not lucky. Will we ever be completely free of wanting other than what we have? Hell no! Will we ever have most of what we want? How about if we win the lottery? 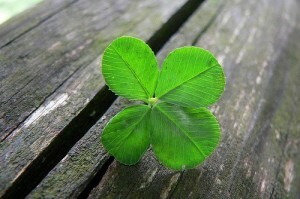 The really lucky ones know that we already have most of what we want – challenges notwithstanding. And the rest will always want something more – even if we win the lottery. How about me? When I’m candid with myself I know I’m very very lucky. But after that minute passes I’ll always want more! And I really want that caribbean retreat – dammit!